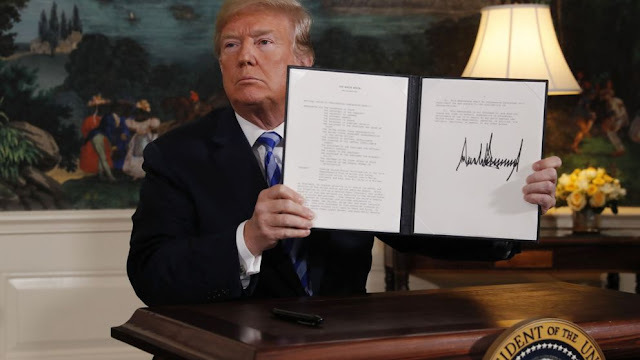 On May 8, 2018, United States (U.S.) President Donald Trump has finally made a decision to broke away from U.S. allies in Europe by officially withdrawing from the Iranian nuclear agreement a.k.a Joint Comprehensive Plan of Action (JCPoA), a most anticipated deal signed in Vienna on July 14, 2015, between Iran, the P5+1 (the five permanent members of the United Nations Security Council — China, France, Russia, United Kingdom, United States—plus Germany), and the European Union. "In just a short period of time, the world's leading state sponsor of terror will be on the cusp of acquiring the world's most dangerous weapons," President Trump announced from the White House Diplomatic Room. "Therefore, I am announcing today that the United States will withdraw from the Iran nuclear deal." The President has also ordered Secretary of State Mike Pompeo and the Secretary of the Treasury Steven Mnuchin to start the processes related to re-imposing all U.S. sanctions lifted or waived in connection with the JCPoA, including those under the National Defense Authorization Act for Fiscal Year 2012, the Iran Sanctions Act of 1996, the Iran Threat Reduction and Syria Human Rights Act of 2012, and the Iran Freedom and Counter-proliferation Act of 2012. The re-imposition of sanctions will come into effect between three and six months from now. It includes sanctions on Iranian oil exports, the country's central bank, and Iranian businesses. According to the geopolitical pundits, the decision made by the Trump administration could have explosive consequences, straining longstanding U.S. alliances in the region as well as globally, disrupting oil supply markets and boosting tensions in the Middle East. To find the necessary way forward, EU/E3 consultations with Iran on the JCPoA took place in Brussels on the same date (May 8, 2018). The meeting was chaired by European External Action Service (EEAS) Secretary General Helga Schmid and attended by E3 countries (France, Germany, and United Kingdom) at the level of Political Directors. The Iranian delegation was led by Deputy Foreign Minister for Political Affairs Abbas Araqchi. "Iran is monitoring U.S. and European stance closely, and will react to U.S. decision based on its own national interests," Abbas Araqchi was quoted as saying by IRNA after the meeting. The EU/E3 used this opportunity to reiterate their support for the continued full and effective implementation of the JCPoA by all sides. Former U.S. President Barack Obama has said President Trump's decision to withdraw from the deal signed during former's time in office is "so misguided" and a "serious mistake". "Today's announcement weakens our security, breaks America's word, isolate's us from our European allies," Former United States Secretary of State John Kerry said on Tuesday. Iran's president, Hassan Rouhani, said: "this is a psychological war." But, he further added - "If we achieve the deal's goals in cooperation with other members of the deal, it will remain in place." Rouhani said in a televised speech. "I have ordered the foreign ministry to negotiate with the European countries, China and Russia in coming weeks. If at the end of this short period we conclude that we can fully benefit from the JCPoA with the cooperation of all countries, the deal would remain." "In response to U.S. persistent violations & unlawful withdrawal from the nuclear deal, as instructed by President Rouhani, I'll spearhead a diplomatic effort to examine whether remaining JCPOA participants can ensure its full benefits for Iran. The outcome will determine our response." Incumbent Foreign Minister of Islamic Republic of Iran Javad Zarif responded to the announcement on Twitter. "China will remain in close communication with all relevant parties and stay committed to upholding and implementing the JCPOA in an objective, impartial and responsible attitude." - China's Foreign Ministry Spokesperson Geng Shuang's Regular Press Conference on May 8, 2018. Prime Minister Lars Løkke Rasmussen tweeted shortly after Trump's announcement that Denmark "continues to support the Iran deal, contingent on Iran’s strict compliance," adding the agreement was "important for non-proliferation and regional security." Federica Mogherini, an Italian politician who has served as High Representative of the European Union for Foreign Affairs and Security Policy since November 2014, said that the "European Union is determined to preserve" the agreement. "Together with the rest of the international community, we will preserve this nuclear deal," she said, Tasnim News Agency reported. French President Emmanuel Macron first responded to the announcement on Twitter, writing that "France, Germany, and the UK regret the US decision to leave the JCPoA. The nuclear non-proliferation regime is at stake." The three nations said they would "remain committed to ensuring the agreement is upheld" and would "ensure this remains the case including through ensuring the continuing economic benefits to the Iranian people that are linked to the agreement." Following the Trump's announcement Israeli Prime Benjamin Netanyahu announced that the Tel Aviv regime "fully supports" Trump's "bold" withdrawal from Iran deal. Earlier this year, during Iranian President's visit to the country, Modi administration extended full support to the effective implementation of the JCPoA, which has been endorsed by the UN Security Council via Resolution 2231 (2015). "There are no - and can be no - grounds for breaking" the deal, the Russian Foreign Ministry said, adding the pact had shown its "full efficiency". "The United States is undermining international trust in the International Atomic Energy Agency." Talking to the reporters in New York, Deputy Russian Ambassador to the United Nations, Dmitry Polyansky said: "We are disappointed as we were before, so it was no surprise." "The kingdom supports and welcomes the steps announced by the US president toward withdrawing from the nuclear deal ... and reinstating economic sanctions against Iran," the Saudi foreign ministry said. "The unilateral withdrawal of the United States from the nuclear deal is a decision that will cause instability and new conflicts," said Ibrahim Kalin, spokesman for President Recep Tayyip Erdoğan, on Twitter. "Turkey will continue to resolutely oppose all types of nuclear arms." The United Nations Secretary-General Antonio Guterres said in a statement that he was "deeply concerned", urging the remaining parties of the deal to abide by their commitments. "It is essential that all concerns regarding the implementation of the plan be addressed through the mechanisms established in the JCPOA. Issues not directly related to the JCPOA should be addressed without prejudice to preserving the agreement and its accomplishments," Guterres said.